Walk into a garden with a hydrangea in bloom and your attention will be captured immediately. The big, bold, colorful blooms of Hydrangea macrophylla (literally, Bigleaf hydrangea) make a statement that cannot be ignored. This is the hydrangea that most of us see in our minds when the name comes up. It’s a favorite pot plant of florists, and we have all probably given or received one at some time in our lives. But it is in the garden that the French hydrangea truly comes into its own. A garden hydrangea is a woody, deciduous shrub measuring 5-6 feet or more tall by about as wide at maturity. Its large leaves, in shades of medium to dark matte green provide the background to the two different bloom forms: 1). Mophead or hortensia blooms, or 2). Lacecap blooms. Both bloom forms are the same plant, if you will, with “different hair color.” This is an area of confusion for many people who are not familiar with lacecap blooms. Yes, they were meant to look that way, and no, the small fertile flowers in the center will never mature to look like their sister, the hortensia or mophead. Their lacey, more delicate look adds a different dimension to the garden. 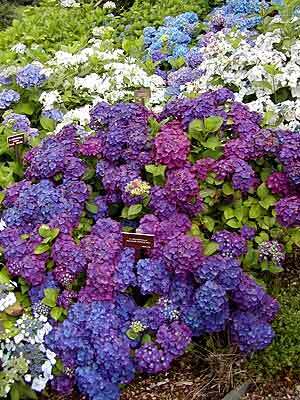 You’ll find hydrangeas at your garden center when they begin to come into bloom. This is a good time to see what is available and what you personally like, but planting hydrangeas in late spring or early summer requires more attention on your part. The newly installed plant does not yet have a root system in place to keep up with the demands of all those big leaves and blooms. You will need to water frequently during dry periods of the first two growing seasons to allow the plant to develop its mature root system (this applies to all newly planted plants, not just hydrangeas). French hydrangeas often appear on lists of shade-loving plants. This is not technically correct. French hydrangeas need direct sunlight to bloom well, at least 4-6 hours. What they don’t need is direct afternoon sun, particularly in the South. Direct sun results in increased “transpiration,” or water loss from the leaves. Hydrangeas planted in the stressful late afternoon sun will appear wilted and in need of water. If there is sufficient water in the soil, the plant will recover by itself as soon as the sun sets. Don’t water a plant wilted by afternoon sun – too much water can result in root rot problems. A hydrangea that is wilted in the morning before the heat of the day definitely needs water – immediately. If you have hydrangeas that have not bloomed while planted under trees, you may want to consider “limbing up” the trees to allow more light to hit the hydrangeas – or alternatively, moving them to a sunnier location in the fall just before they start to lose their leaves. When you bring your hydrangea home, you will need to dig a hole at least twice the size of the pot it is in. Think about this before you choose between the 2-gallon plant and the 5-gallon plant. A smaller plant will quickly grow to the size of a larger plant and will probably suffer less transplant shock. Be aware that almost all hydrangeas in nursery pots will have pink blooms due to the lack of aluminum in the potting soil. Once in the ground their color can change depending upon the pH of the soil – more on this later. · 1 part either finely ground pine bark chips or granite sand or another soil aerator such as an expanded slate chip product. Editor’s Note: New evidence suggests that the planting hole not be amended with additional materials but rather that the native soil be well broken up. In theory plant roots would penetrate through the amended hole and into the native soil, but in reality they tend to be lazy and the planting hole acts as a container actually causing a potbound situation. If soil amendments are required it is best to add them to the entire planting area instead. Remove your plant from its pot and inspect its roots. If the roots have formed a mat or are growing in a circle around the outside of the soil, the plant is “potbound”. Be ruthless in loosening and cutting away these matted roots. You may end up reducing the root ball of the plant considerably. Don’t worry, the roots will grow back and will now grow out into the surrounding soil. I keep a serrated knife or an old tree saw in my tool basket just for such transplanting situations. Set the plant in the prepared hole. If you’ve dug too deeply, you may have to remove the plant and refill the hole with the amended soil to a point that the crown of the plant is at or slightly above the surrounding soil level (remember that adding water will compact the soil below the plant – you may want to plant slightly high to compensate for this). Before placing the plant back in the hole sprinkle in a handful (about ½ cup) of a good balanced (three even numbers) timed-release fertilizer that feed the roots for 3-4 months. Once your plant is placed, begin to refill the hole with the amended soil. Gently firm the soil as you go until you have the hole well filled. Finally, finish the planting by watering thoroughly (that means until air bubbles stop coming to the surface from the surrounding soil. This insures that the soil and the roots are in direct contact and avoids losing precious roots to drying out. Top the soil around the plant with a two-inch layer of a good mulch to help with moisture retention. Sit back a watch your plant grow. Don’t be impatient for blooms in the first two years on small (1 gallon) plants. Smaller plants are usually putting all their energy into growth in their first two seasons. Also, avoid high nitrogen fertilizers (those with a high first number) that will only cause rapid green growth, not bloom. High phosphorus fertilizers (a larger second number) – sometimes called bloom boosters – are also not helpful for hydrangea bloom production. If there is one issue that confuses even experienced gardeners, it’s when or if to prune French hydrangeas. In the South, think of French hydrangeas the way you would an azalea – prune after blooming. This usually means in July – certainly before the first of August. The plant will not be hurt by removing up to a third of the growth – the new growth that will appear after pruning contains the bloom buds for the next season. Avoid any fall pruning – you’ll only be removing your blooms. It may be true that the leafless branches of a hydrangea are not the most attractive part of a winter garden, however, if they have been planted correctly with a good background of evergreen foliage, they are not nearly as distracting. If an older plant has been allowed to outgrow its location or has become leggy and bare on the bottom, it may need a good “renewal pruning.” Renewal pruning means pruning the plant back severely (down to 18” or below) in either early spring or after bloom. You will end up with a “stump” with few if any leaves, but the large, mature root system will quickly renew the plant. You will sacrifice bloom for that growing season, but gain a better-proportioned plant. Just don’t try this in the fall as you can kill your plant. One final pruning chore is spring cleanup done as the hydrangea buds begin to emerge. Examine each plant for older or dead branches and remove them as far back as the ground (you may need a pair of loppers for this). Removing old canes regularly encourages new growth. You can test a branch for living tissue by scratching it lightly with a thumbnail or pocketknife – if there is a green layer just beneath the surface, it’s a living branch. This is also a good time to nip off any remaining dead blossoms. · Pluck or snip off any frost-damaged leaves – undamaged leaves will quickly fill in and your plants will look much better. Hydrangeas for American Gardens, by Michael A. Dirr, Timber Press, 2004. Michael Dirr is the eminent University of Georgia horticulturist and author of many widely respected works such as Manual of Woody Landscape Plants. His hydrangea book is well researched and informative as well as full of beautiful color plates. Encyclopedia of Hydrangeas, by C.J. Van Gelderen and D. M. Van Gelderen, Timber Press, 2004. Again, another excellent reference filled with color plates and descriptions of hydrangeas from across the world. It’s interesting to compare information with that contained in Dirr’s book. your site is really helpful… looks like I’ll be waiting til next summer to prune my hydrangea…. and hopefully the bush will survive my ignorance!